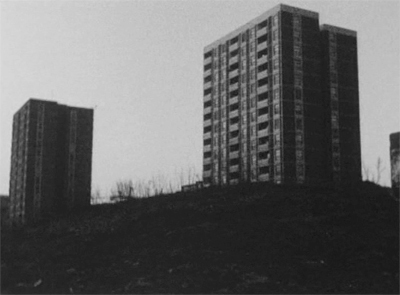 'Here After', by the filmmaker Inger Lise Hansen, is a black and white 16mm and 8 mm film was made in collaboration with the artists Paddy Jolley and Rebecca Trost. It was shot in the empty flats in Ballymun, a 1970’s high-rise suburb on the outskirts of Dublin that was due for demolition. In February 04, the work was projected by 16 dvd projectors, onto the wall-papered and painted walls of four vacant flats on Shangan Road. This quasi-elegiac document of the demise of the interiors of the vacated homes, verges on the morbid, the forlorn. However, through the gritty greys, blacks and dirty whites of the film, the discarded pieces of furniture seem liberated by the departure of people and come to life in a macabre dance amongst the dust and dereliction.